Many people dream of real pine flooring of wide wedge-shaped boards, treated with linseed oil soap. Björn Einarsson was not satisfied with just dreaming. He sawed and planed his own flooring, which is now put down in his kitchen. “It will be pine flooring in the greater part of our house,” he says. 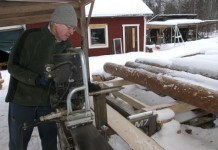 Björn is a carpenter and an active forest owner in the village Fageråshöjd north of Karlstad in Sweden. 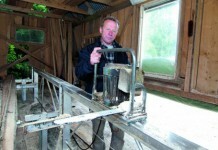 He runs a farm that has been in the family since 1796. The present dwelling house was built in 1862 and has been renovated several times. The last time was 20 years ago. “At that time, the children were small and we hadn’t the possibility of renovating the way we wanted. We used chipboards and vinyl flooring,” says Björn. But already then, he and his wife Carola had a plan for the next renovation. It would be really wide, wedge-shaped pine boards as flooring throughout the house. The raw material for the flooring was found in their own forest, and they planned to hire a local circular sawmill to cut the logs. “A couple of years ago we bought a forest property from an estate of a deceased person. 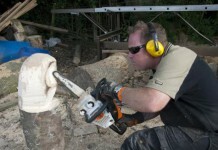 The purchase included a Logosol Sawmill M7. It never occurred to me to use it for sawing floorboards, so I put it up for sale. I got it sold immediately,” says Björn. 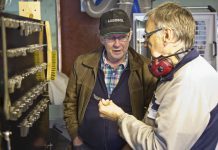 Certainly, the large circular sawmill could manage 80-100 logs a day, but the sawblade was too small for the desired dimensions, and later the owner decided to close down the business. 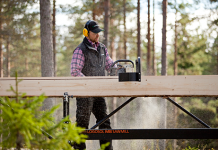 In addition, a circular sawmill is not suitable for cutting rough-edged boards of that large dimensions, so Björn ordered a new Logosol Sawmill, an M8 extended with a half sawmill and the largest electric saw unit E8000. “It’s good that the M8 is narrower, it doesn’t take up much space, but at the same time it feels stable,” says Björn. The most large-sized pines, up to 50 cm at the root end, ended up on the log table. 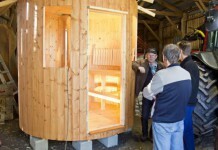 From them he cut over 6.2 metre long, rough-edged boards, which were put for seasoning in his homemade wood kiln equipped with a drying unit from Logosol. ”The kiln is over one metre longer than recommended, but is of less volume, so the drying unit is more than sufficient,” Björn explains. In the next step he cut the edges using a handheld circular saw and a guide rail. The floor boards were cut to 1.5 inches, which means 38 mm thick boards. They were first planed on top, and then underneath so that the final measurement was 30 mm. Back in the old days, flooring was planed by hand. Considering the width of the boards, this could have been the only alternative for Björn. The widest board is over 400 mm at the root end, and that takes a special planer/moulder. However, Björn has the right equipment, a Logosol PH360 four-sided planer/moulder. 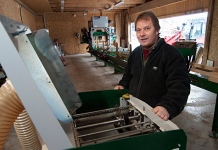 “I removed the side cutters and could use the whole 510 mm wide top cutter,” Björn explains. 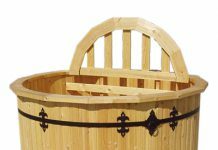 Instead of making tongue and groove, he only cut grooves in the sides of the boards with a handheld slotting cutter and then conjoined them using loose tongue joints. At the same time he has extended his house with 50 square metres on two floors. In the new part there is a big kitchen, in which the pine flooring has been put down. More timber is being seasoning, and the plan is to replace the chipboards and vinyl with pine flooring in the greater part of their house. Wide floorboards do not require as much prep work. In the kitchen, Björn has fitted joists that are 50 x 50 mm on a concrete slab. The distance between the centres of the joists is 600 mm. Between the joists lies groove milled styrofoam with underfloor heating. There is not a shred of springiness in the floor. 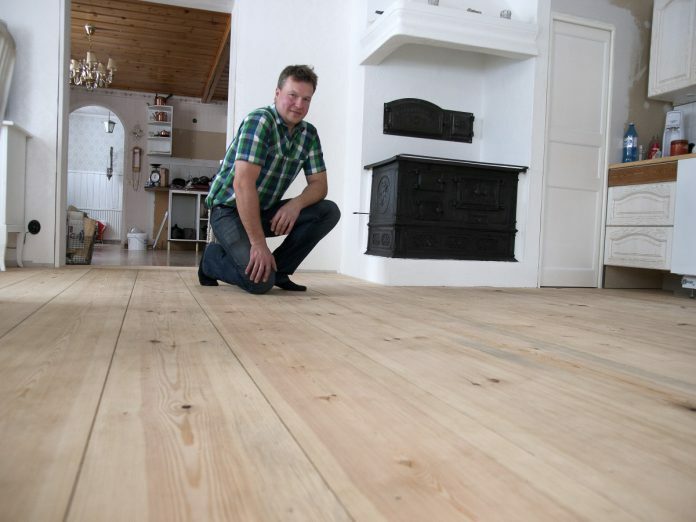 There are some manufacturers of wide pine floorboards in Sweden, but Björn states that buying ready-to-use flooring costs as much as the entire investment in machines. In addition, he will make mouldings, panelling and other wooden parts for further renovation. 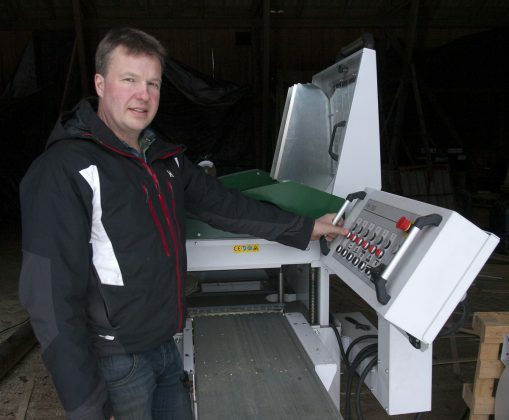 “If you have the right equipment, it’s not hard to make your own flooring. In addition, it’s fun,” says Björn Einarsson, who finally has got the floor he has dreamt of for over 20 years. 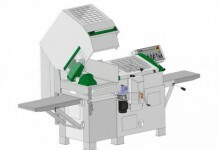 A stable four-head planer/moulder for professional production. 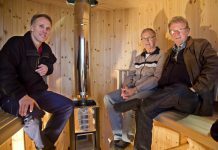 This completely new machine has its place in environments such as woodworking shops, timber yards, homebuilding facilities and, naturally, in the construction trade.